Sunday, 1 December, will be remembered by fans of underwater activity in Moldova. On this day was held the first national freediving championships – “Breath of air, or how much or how much could you stay under water?” organized by the Sporter.md sportive social network, Federation of Underwater Activities of Moldova and Niagara fitness club. The tournament, which was held in one of the best pools in Chisinau – that of Niagara fitness club, was attended by 28 brave men, including four women. By the way, the oldest of them was 61! This was Liubovi Metlova – the winner of the tournament in table tennis “Sporter Weekend. Ping-pong day”, held last week in a big way. 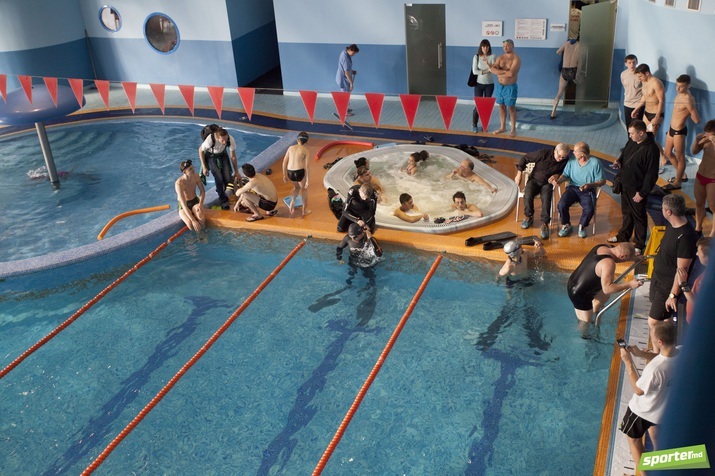 Competitions were held in two disciplines: static apnea and dynamic apnea. The athletes have competed in holding the breath under water in a static position and in overcoming the distance. Before the beginning of each exercise, participants were given 30 minutes to prepare. At this time, took place the draw, as a result of which each of them was assigned a serial number, and then started the performance. All begun! First scoring discipline was static apnea. 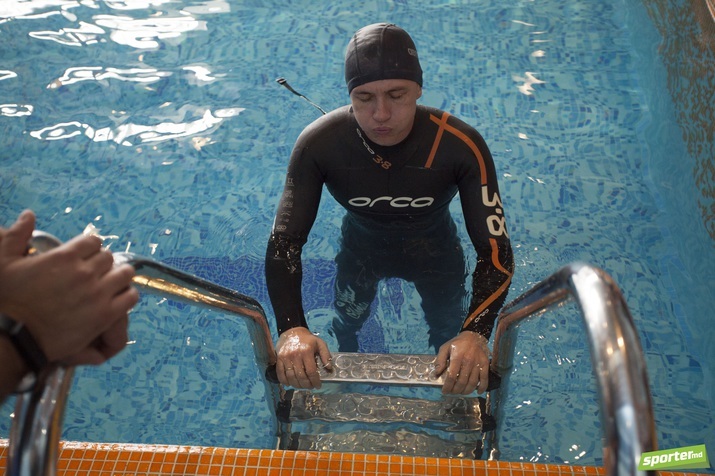 It so happened, that Vadim Boldetchii performed the sixth and demonstrated impressive results – 4 minutes 34 seconds under water without air! It seemed that beating this achievement has not been possible, and further fight does not make sense. 51-year-old Vadim Jurov performed the 15th, who survived under water for more than 4 minutes. However, he could not beat the best result of Vadim Boldetchii, because he was short of 30 seconds. But the interesting thing started when the 19th participant Dmitrii Volosin came in water. The athlete lowered his head under the water, the count went. When the numbers on the stopwatch overcame the barrier of 4 minutes, almost all with bated breath, were watching Dimitrii. 4 minutes 30 seconds … 31-32-33-34-35 …! The best result was acquired. All eyes were fixed at relaxed body of the athlete dangling under water. Diver, manned underwater, monitoring the status of competitors, once again put a hand to the athlete and received a response – a raised index finger. That is all right, Dimitrii continued exercise. Meanwhile, stopwatch showed more than 5 minutes. 5 minutes 20 seconds, 5 minutes 25 seconds, 5 minutes 29 seconds. At around 5 minutes 29 seconds 16 milliseconds Dmitrii Volosin surfaced and demonstrated a mandatory sign “okay”. This means that he feels fine. The result has been counted. There was a silence, a change of a storm of applause. Curtain. We think there is no need to talk that no one could beat achievement of Dmitrii Volosin, and that he took a well-deserved first place. Of course, we should note the results of Andrei Ogorodnicov, Vasile Chircioglo and Andrei Susvaliuc, kept in static underwater for more than 3 minutes, and Igor Miachinin, Vladimir Balandin, Alexander Mocreac and Gleb Tugui, who did not have a few seconds to 3 minutes. And of course, we cannot ignore the effort of all the other participants, who deserve praise for at least the courage to take part in such a competition. After a pause, the athletes have begun to identify the best in dynamic apnea. This time the competition was attended only by two members, and the distance they overcame under the water, was recorded on a huge line attached to the edge of the pool edge. Dmitrii Volosin was the best in this discipline. However, after the success in the static apnea, his result of 110.5 meters is not a surprise. The second was Vadim Jurov with the result of 100 meters, and the third – Igor Miachinin – 89 meters. 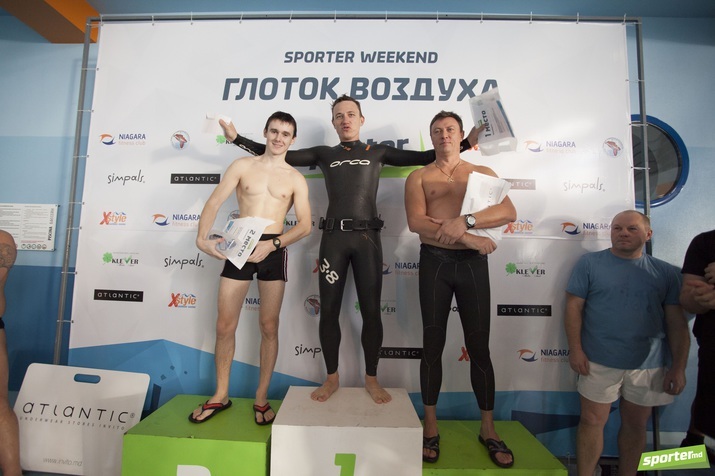 Just five participants took the fourth place swimming under water 75 meters – Dmitrii Chirilov, Andrei Susvaliuc, Adrian Negru, Danici Nichita and Alexei Terzi. It is worth noting the result of Gleb Tugui, who, unlike other participants performed without fins, and covered a distance of 66 meters. Among women in the static, the best result showed Anna Daschevici – 1 minute 11 seconds, and in the dynamics – Tatiana Ursu – 40 meters. Winners received gifts from the X-Style and Invito stores, as well as from the Federation of Underwater Activities of Moldova. Invito chain of underwear stores provided to the best freedivers certificates for the heats of the Atlantic company, and X-Style store – certificates in the amount of MDL 1,250. Special thanks to the ideological inspirer of the Federation of Underwater Activities of Moldova for the assistance in the organization of competitions, to Niagara fitness club for providing swimming pool and a comfortable environment for participants, to Invito shops and the X-Style for gifts to athletes as well as to Klever-Media marketing agency for printing banners and posters.